Driver's License - ASK. LEARN. VOTE! If you have a Wisconsin-issued DOT driver's license then chances are that you will see no issue at the polls. However, make sure to double-check that your ID meets all requirements to avoid any confusion. You can have an old address on your license. However, if you still need to register to vote at your current address, you will need to present proof of residence that proves where you live such as a utility bill. 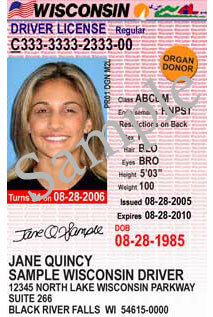 Your driver's license can be expired or suspended. You cannot vote in Wisconsin with an out-of-state ID.